Switched to DIY, No Regrets! Hi and welcome to UT! I hope that you’ve been enjoying your freshman year so far! It’s definitely both an exciting and stressful time; finding activities and organizations that help you navigate the college process is critical, and FRI is a great start. I initially started with the Freshman Research Initiative with placement in the Artificial Intelligence and 3D Printing stream. As a computer science major, I felt obligated to place the aforementioned and Autonomous Robotics streams as my first choices, without really considering or looking at much else. While I learned quite a bit about AI, from neural network organization to genetic algorithms, I didn’t spend much time doing the assignments outside of my dorm or the PCL. 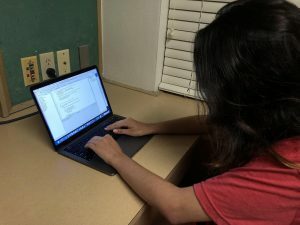 There wasn’t necessarily a requirement to physically be in lab when everything could be done individually from a computer. Thus, when the stream shut down at the end of last spring, I began looking for other FRI streams that had more of a “wet lab” approach but still let me improve upon my programming skills. DIY Diagnostics felt like a good fit. Since I’ve begun this semester, I’ve already met plenty of other students who are all actively working on such unique projects. I’ve heard of ideas that range from collecting and categorizing water samples at Waller Creek to creating sensors that detect bends in order to better diagnose disorders like scoliosis. The project I was particularly drawn to was one the lab has been building upon-mapping the typing patterns of Parkinson’s patients. Over the past few years, different members of the lab have mapped the typing patterns of patients with Parkinson’s from varying periods in their diagnosis. Using this data, they’ve been able to derive that patients change their typing patterns and reaction times when they begin to develop symptoms of the disorder, such as a tremor. By collecting more data, an algorithm that utilizes reaction times from mapped typing can be created to diagnose Parkinson’s effectively and early on. Additionally, mapping one’s typing can be done to find other trends as well. Past projects done in the lab with type mapping have been able to determine trends in sleep deprivation, caffeine usage, and if someone is coding or not. Although I am definitely leaning towards studying Parkinson’s patients, the diversity of projects that all hinge on keyboard mapping was something that got me incredibly excited and drew me into the project. Additionally, one of my favorite parts about the DIY Diagnostics stream is the community fostered. Having transferred in, I felt a little lost at first. However, everyone-the professor, students, and mentors-are eager to help and make sure everyone is able to find footing when it comes to joining a project. There’s always plenty of support, whether it be having small group meetings, having huddle meetings, or having student mentors always available during lab hours. Even the Parkinson’s project I recently joined has group meetings every week just to ensure that everyone stays on track and is working progressively. Ultimately, FRI has been an incredibly rewarding experience for me. Research can be tough; sometimes, it might feel like you’re stuck in repetition or not going anywhere, but it’s important to persist and seek help or mentorship. It definitely takes a moment to get acclimated to the lab environment; FRI has always been a course that differs so greatly from everything else that I’ve taken during my time here at UT Austin. But, as long as you put in the effort, DIY Diagnostics is most definitely a stream that will give you the tools you need to succeed.